In February this year, a 122-day dharna outside Kerala's Kannur Collectorate by a Dalit woman autorickshaw driver named Chitralekha finally came to an end. Chitralekha, facing ostracism from other drivers, had been on strike since October 2014 only called it off when Chief Minister Oommen Chandy assured her that she would be rehabilitated in another town in Kannur district. But three months later, her struggle continues and here's where our story begins. Taking on the system is not easy in India. It’s even more difficult if you happen to be a Dalit woman who belongs to a caste that forms the bottom rung of the social order in your region. Thirty-nine-year-old Chitralekha’s life has been particularly difficult for 11 years ever since she began to drive an autorickshaw for a living. Chitralekha, who is from Payyanur in Kannur district of Kerala, belongs to the Pulaya castes whose members were historically almost slaves of feudal landlords and bound to do their bidding. As a Dalit, a woman and an autorickshaw driver, she says that the she is often ostracised by other drivers because of her layered identity. An added dimension to her troubles is her choice to have married a man from the Thiyya caste, an intermediate caste of toddy-tappers which has been classified as OBC by the government. So why drive an autorickshaw? In 2004 Chitralekha was in dire straits after she was forced to give up an education in nursing due to financial issues. The idea of driving an autorickshaw appealed to her so she purchased a vehicle with the help of a bank loan and began to go to the stand in the Edatt area of Payyanur town. All the other drivers at that stand, who were members of the Centre for Indian Trade Union (CITU), a wing of the Communist Party of India (Marxist), didn’t take to her arrival too kindly. “They were not able accept a woman auto-driver, that too a Dalit woman, doing the same job they do. Since then, they have been torturing me,” Chitralekha says. At first, it began with casteist slurs. “They abused me by my caste in front of customers and other local people,” she says. Then it moved on to branding her, her mother and her grandmother as “local prostitutes”. “Within two months they asked me not to park my auto in the stand,” she says. Determined not to be cowed down, Chitralekha began to fight back, and lodged complaints with the police over the alleged harassment. As a result some of them were arrested, but still, the harassment continued and even turned into serious assault. “Once, they tried to run me over with an auto. But the worst was when they burned my auto in December 2005, just one year after I bought it,” she says, breaking down into tears. Besides overt assaults and alleged arson, they used other tactics to lower Chitralekha’s morale. Posters citing her and her mother’s “loose morals” appeared in areas she frequented. They described her as a woman who drinks, talks like a man, who does not know how to behave, called her mother a prostitute, and so on. “I was not ready to give up and fought back with all my strength. I protested with the help of some human right activists, feminists and with the media,” she says. She was able to resume her driving after the activists helped buy her a new autorickshaw. Soon however, things became more dangerous. Chitralekha’s brother-in-law, who was mistaken for her husband, was stabbed and the main accused is still absconding. She and her husband were forced to flee to Thaliparamba, 20km away from their hometown and live almost in hiding. In 2010, a group of activists formed the Chithralekha Rehabilitation Committee. With the intervention of adivasi activist C K Janu, her campaign gained media attention. Talks with the district leadership of the CPI(M) resulted in a temporary truce and for some time Chitralekha was able to park her auto at the Edatt stand. But the trouble started again. She and her husband were beaten up many times, and in 2010 their daughter was attacked as well when she was just 10 years old. 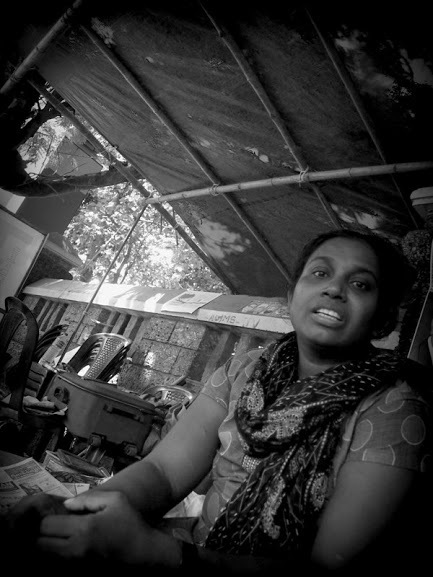 CITU workers vandalised her house many times, verbal and physical abuse became regular, she claims. Chitralekha even became the accused in eight suspicious cases, including one in which she and her husband were arrested in and spent 20 days in the Kannur district sub-jail in 2014. After a dharna in a makeshift tent outside the Kannur Collectorate in October 2014 for 122 days and only called it off in February this year when Chief Minister Oommen Chandy assured her that she would be rehabilitated in another town in Kannur district. “He promised to allot me a land to build a house in another place. The government gave me another auto,” she says. The government has not yet given Chitralekha the land and house that was promised. Now although both Chitralekha and her husband are working as autorickshaw drivers, they still cannot work at the Edatt stand. In spite of everything, Chitralekha is determined to never give up her right to work lawfully in a place of her choice. “I just need to be able to work and live peacefully without life-threatening insecurities.” Read- No longer an agrarian state, is Kerala even concerned?